Written by Julie Clapp, Regional Coordinator in Dallas, TX. Talk to most WyldLife staff, and they’ll tell you themes are a great way to engage middle school kids in club. Themes can make club feel more like a party and give leaders a place to start as they plan mixers, games and music. When club has a theme, kids can look forward to something specific. Kids (and parents) start asking “What’s the theme?” and create excitement for club. Just remember that middle school kids would rather participate than watch so whatever your theme – it’s best to emphasize mixers that involved every kid rather than up-front games with a few kids. Kids wear white T-shirts. As they arrive, give them glowstick necklaces and highlighter pens to decorate shirts. Turn off the lights and play games under the blacklights. Another idea? Give kids fluorescent post-it notes and tell them to stick notes on someone wearing tennis shoes… someone with a ponytail… their WyldLife leader. Don’t forget to include a short dance party. Build club around group competitions, starting with best attendance. Plan mixers and games that feature guys competing against girls. Award points for each round and declare a winner. Other ideas? Battle of the classes – assign each class a color and encourage them to wear T-shirts representing their class. Or if you have multiple schools in one club, let schools compete. Kids wear their favorite jerseys. Choose activities that highlight hotdogs and football – a hotdog eating contest or a football toss through hulu hoops. Play “Don’t Fumble” and give every kid a brown balloon to blow up. They must hold their balloon with one hand while they try to pop or knock away other “football” balloons. Divide kids into groups with their leaders. Announce categories one round at a time and ask teams to make a video or take a picture that fits. (Build a pyramid. 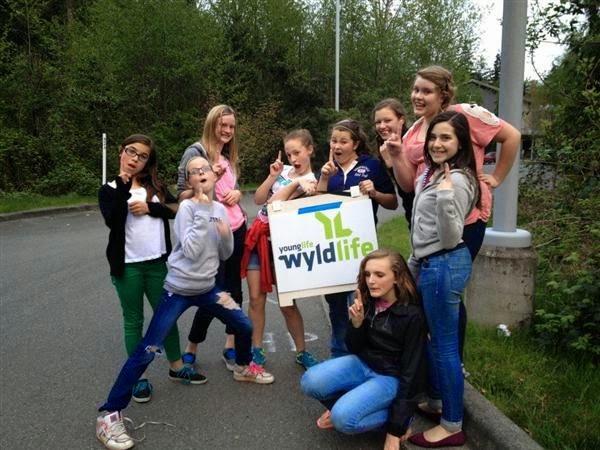 Imitate your favorite WyldLife leader. Walk the red carpet.) Then project the videos or photos and lets kids see themselves on the big screen. Be sure to include a hashtag for the club so you can gather the videos and photos. Celebrate every kid’s birthday in one night. Play classic birthday games like Pin the Tail on the Donkey or let kids take a swing at a piñata. Sing “Happy Birthday” and end club with a piece of birthday cake for every kid. Plan a club where every element involves food. Kids toss tater tots dipped in kitchen into their partners’ mouths. Put fast food in a blender and let kids guess which meal is which. Everyone plays paper plate musical chairs or participates in a relay passing raw biscuits from forehead to forehead. Keep it simple and plan club around the nearest holiday. Thanksgiving, Christmas, Halloween – all can be great themes for club. (Valentine’s Day can be a little trickier with this age group, so be careful here.) Use the JibJab app to make your kids and leaders the stars of holiday-themed videos. Remember that middle school kids often lack self-confidence and want desperately to be accepted. If the theme involves dress-up that is too elaborate, some kids may not to come to club because they are insecure about what to wear. Keep themes simple so that every kid can participate - wear red, white or blue for ‘Merica club. Or be ready to help them fit in - give kids leis as they walk in the door for Hawaiian club. Now that high school clubs often feature themes as well, you’ll want to have an area strategy for club so kids don’t see the same themes year after year. There may be some themes that you reserve exclusively for WyldLife and others that are reserved for high school club. Find 131 more YL Theme Club ideas here.